Geographical Prospective: SSC is a geographical area including a group of villages, which the planner makes sure is the optimum solution from technical, economic, environmental, and institutional points of view. Institutional Prospective: SSC is an administrative unit of rural wastewater sector, which is a part of the organizational structure of HCWW companies. This approach ensures the provision of integrated services and hence achieving objectives of this strategy, since it realizes both a technical and an environmental dimension. By establishing a system that accommodates wastewater collected from sewered villages, to be treated in a central treatment plant. This plant would be able to receive the four possible types of polluted water that be generated from unserved villages. Since failure in solving the rural solid waste problem may lead to a shortage to achieve or not achieving the main objectives of the rural sanitation strategy; this strategy should accommodate solid wastes. The second approach is the unclustered, decentralized sanitation approach. It was revealed that isolation of existing initiatives and lack of commitment by government agencies are significant factors preventing wide-scale replication. None of the approaches tested so far have been institutionalized. So far, the sector is in a vicious cycle as isolated initiatives remain prototypes and, as such, are not cost-effective, do not receive the attention required, are considered too expensive and/or prone to failure, and therefore are not replicated. It is clear that HCWW and its Affiliates must play a pivotal role in the development and management of small-scale sanitation. Experience has showed that fully community-based approaches do not work in the Egyptian context. A clear strategy is needed, including other sector stakeholders (Ministries, communities, NGOs, researchers, private service providers). In particular, the solution implies a closer collaboration with the Ministry of Water Resources and Irrigation (MWRI), a significant stakeholder of rural sanitation that manages both important surfaces of land and receiving water bodies. The strategy should enable the implementation of financial and management schemes, which guarantee full-cost recovery. Otherwise, small-scale systems risk not to be maintained properly, as the O&M of big centralized schemes is in itself currently a problem. The only way to proceed until water tariffs guarantee cost recovery is to adapt the legal and regulatory framework to allow tailor-made financing schemes, which may include contributions from concerned communities. Wide-scale replication implies standardization. In this approach it is recommended to devise & adopt a mass-production strategy for small-scale sanitation and explore the concept of locally produced prefabricated units. Standardization of small-scale sanitation systems is needed to allow economies of scale, reduction of costs, reduction of time needed for project preparation and implementation and increase the infrastructure quality. Quality of the work done by consultants and contractors, as well as delays and cost overruns during implementation, are major issues, which standardization is best able to tackle. Many strongly advocate for the adoption of a business approach and the opening of a market for prefabricated treatment units. Such units could easily be manufactured in Egypt. There is a potentially huge market in the country and beyond. Small-scale sanitation could create a lot of job opportunities in production and implementation. Public-private partnerships (PPP) could be developed to stimulate such a process. A clear governmental strategy and leadership is required to support such a standardization process. Finally, even if often considered as a must in Egypt, chlorination of the effluent is not recommended at all. It is almost never done properly and leads to environmental damage rather than preservation, in an environment where the quality of the receiving water body is often much worse than the non-chlorinated effluent. What is more, a shortage of chlorine makes it difficult for both water and wastewater plants to meet their supply needs (Chemonics Egypt 2009). Focus on preliminary assessment Thorough preliminary assessments, leading to realistic design parameters, are a key cost-effectiveness factor, as they allow dimensioning as close as possible to the needs. “Soft components” (e.g. preliminary interview of stakeholders and management schemes) must become an integral part of each design. Animal manure and effluent of dairy factories need to be considered as parts of the sanitation system. In the past, faulty dimensioning of infrastructure, due to the lack of consideration of the actual situation on the ground, has cost a significant amount of money in capital and operational costs, and threatened the replication of small-scale systems. Besides, treatment facilities that are over-dimensioned risk reaching the full life expectancy (especially specific components like pumps) far before they reach their design capacity. Over-dimensioning may also lead to reduced performance. In parallel, a good forward planning is necessary, in order to anticipate future developments and design the system accordingly. It is unrealistic to plan for a 2050 horizon for such small settlements. The development of ezbas is highly heterogeneous and depends on a number of factors that are difficult to forecast, leading to large variations in growth. Modular, flexible systems need to be privileged in order to cope with the high uncertainty of future developments. Realistically, in this context, infrastructure development should be limited to a maximal 15 year planning horizon. However, space for future extension should be planned from the beginning; infrastructure can then be extended when and if needed. Take a look at this clip of the UNDP Lake Manzala Engineered Wetland Project, which investigated the suitability of using artificial wetlands as a low-cost alternative for treating sewage from cities, towns, and villages located on the fringes of the Nile Valley and Delta. Finally, a long debate is on going between the supporters of both techniques and through different levels. Although, deeper and more extensive comparison must be made in order to pre-select the optimal approach to be implemented nationwide or at least identify the geographical location where each approach could be implemented in needed. Yet, the on-going economic crisis Egypt suffers and the on-going threat to a contest water share of the Nile river should encourage The Government of Egypt, which is increasingly aware of the rural sanitation problem, to immediately be committed to implement a National Program for Rural Sanitation in Egypt, the scale of the program should be national, and program interventions are expected to touch nearly every village and household in the Nile Valley and Delta. A well-conceived strategy based on an informed analysis of problems, participants, objectives, and alternatives is needed to ensure that the limited program resources, plus additional resources leveraged by the program, achieve the program’s objective; as the hazards of this problem do not affect only the environment and public health, but also the objectives of water resources management strategy in Egypt. 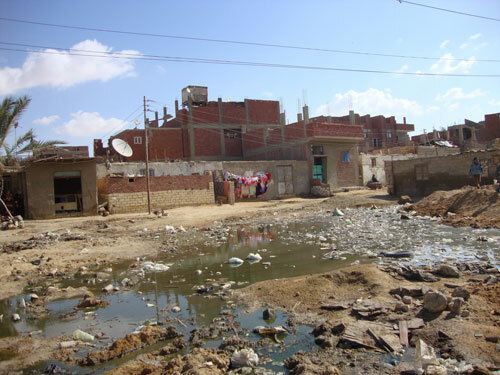 Such a strategy comprises inclusively strategic tasks relevant to the solution of solid waste problem (domestic wastes and agricultural residues) in villages because solid wastes are currently considered one of the important factors causing pollution of residential areas, agricultural drains, and waterways in rural Egypt. The role of local administration and public private partnership should also be activated.